THE DIRECT ANTERIOR APPROACH The Direct Anterior Approach to Total Hip Replacement is a tissue-sparing alternative to traditional hip replacement surgery. Using the anterior approach allows the Dr. Murphy to reach the hip joint from the front of the hip as opposed to the lateral (side) or the posterior (back) approach. This technique allows Dr. Murphy to work between the patient‘s muscles and tissues without detaching them from either the hip or thighbones, sparing the tissues from trauma. The most important muscles for hip function, the gluteal muscles that are attached to the pelvis and femur, are left undisturbed and, therefore, do not require a healing process. This tissue-sparing anterior approach provides the potential for less pain, faster recovery and improved mobility over traditional hip replacement surgery. POTENTIAL BENEFITS Keeping the muscles intact may also help to prevent dislocations and give patients greater mobility sooner than with other approaches. Conventional posterior hip replacement surgery typically requires strict precautions, and limits hip motion in most patients for 6 to 8 weeks after surgery. Patients must limit flexing of the hip to no more than 60 or 90 degrees which complicates normal activities like sitting in a chair, putting on shoes or getting into a car. Although each patient responds differently, the Direct Anterior Hip Replacement procedure seeks to help patients more freely bend their hip and bear their full weight immediately or soon after surgery. With the anterior approach, Dr. Murphy uses one small incision on the front (anterior) of the hip as opposed to the side or back. Since the incision is in front, the patient avoids the pain of sitting on the incision site. The incision in normally 3-4 inches with the anterior approach so there may be less scarring than with the 8-12 inch incision used in traditional hip replacement surgery. CONSULTATION & EVALUATION Every surgical procedure has risks and benefits. 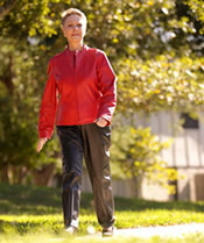 The way a hip replacement performs will depend on age, weight, activity level and other factors. Only an orthopaedic surgeon can tell a patient if hip replacement is right for them. Contact Murphy Wainer to schedule an appointment with Dr. Timothy Murphy to determine if you are a candidate for the Direct Anterior Approach Hip Replacement procedure. THE DIRECT ANTERIOR APPROACH The Direct Anterior Approach to Total Hip Replacement is a tissue- sparing alternative to traditional hip replacement surgery. Using the anterior approach allows the Dr. Murphy to reach the hip joint from the front of the hip as opposed to the lateral (side) or the posterior (back) approach. This technique allows Dr. Murphy to work between the patient‘s muscles and tissues without detaching them from either the hip or thighbones, sparing the tissues from trauma. The most important muscles for hip function, the gluteal muscles that are attached to the pelvis and femur, are left undisturbed and, therefore, do not require a healing process. This tissue-sparing anterior approach provides the potential for less pain, faster recovery and improved mobility over traditional hip replacement surgery. POTENTIAL BENEFITS Keeping the muscles intact may also help to prevent dislocations and give patients greater mobility sooner than with other approaches. Conventional posterior hip replacement surgery typically requires strict precautions, and limits hip motion in most patients for 6 to 8 weeks after surgery. Patients must limit flexing of the hip to no more than 60 or 90 degrees which complicates normal activities like sitting in a chair, putting on shoes or getting into a car. Although each patient responds differently, the Direct Anterior Hip Replacement procedure seeks to help patients more freely bend their hip and bear their full weight immediately or soon after surgery. With the anterior approach, Dr. Murphy uses one small incision on the front (anterior) of the hip as opposed to the side or back. Since the incision is in front, the patient avoids the pain of sitting on the incision site. The incision in normally 3-4 inches with the anterior approach so there may be less scarring than with the 8-12 inch incision used in traditional hip replacement surgery. CONSULTATION & EVALUATION Every surgical procedure has risks and benefits. The way a hip replacement performs will depend on age, weight, activity level and other factors. Only an orthopaedic surgeon can tell a patient if hip replacement is right for them. Contact Murphy Wainer to schedule an appointment with Dr. Timothy Murphy to determine if you are a candidate for the Direct Anterior Approach Hip Replacement procedure.